I wish you a wonderful 2015, may all your days be filled with joy and happiness and may all your dreams come true! 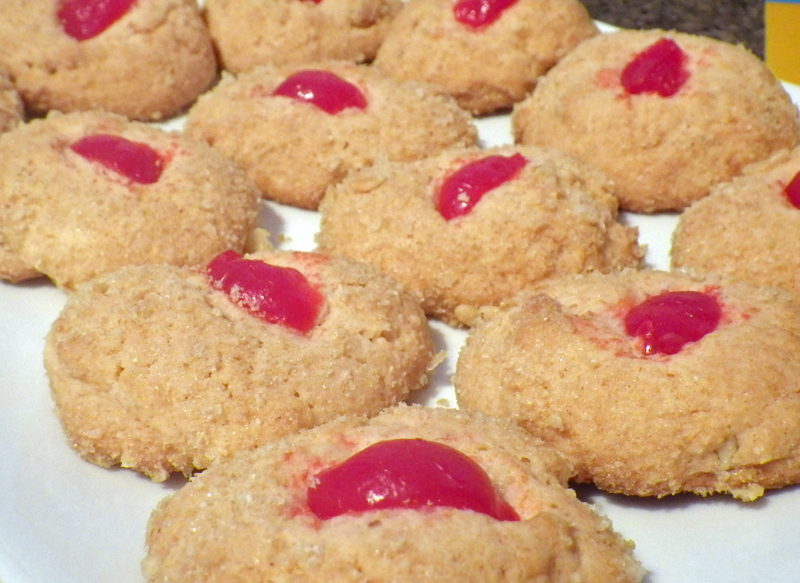 For the first entry of 2015 I would like to share my all time second favourite cookie recipe, they will melt in your mouth 🙂 I really like maraschino cherries, if you don´t, you can use whatever berries you have! This recipe is from the Hannah Swensen book series “Fudge Cupcake Murder” by Joanne Fluke. Melt butter and add white sugar. Mix, then add eggs. Stir it all up with the vanilla, cherry juice, baking powder, baking soda and salt. Add the flour and mix well. I also added crushed walnuts. Crush the corn flakes and put them in a small bowl. I used Kellogs Special K because I did´t have Corn Flakes. They worked very well. Roll dough balls with your hands. I always use a teaspoonful of dough to make these balls. 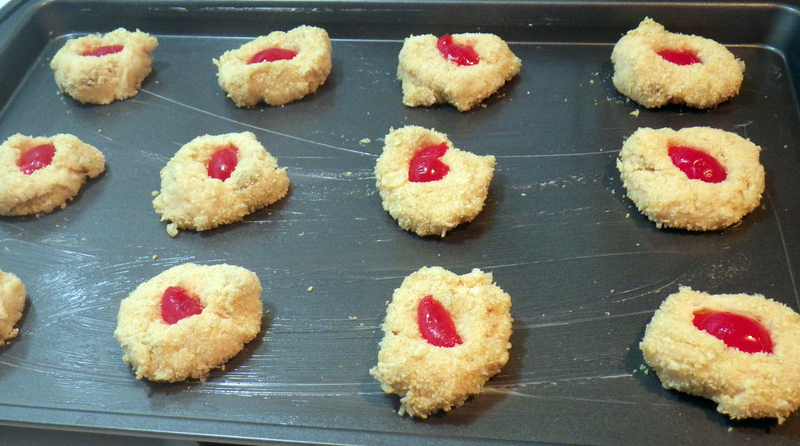 Roll them in the crushed corn flakes (or Special K) and place them on a greased cookie sheet, 12 to a standard sheet. Smush them down a bit so they won´t roll off. Cut the cherries into quarters (next time I will use a whole cherry for one cookie, I just didn’t think a quarter quite did it) and place one on the top of each cookie. Press the cherry down with the tip of your finger. Bake 375 degrees F for 10 to 12 minutes or until nicely browned. To make it more interesting you can use both (if you can find) – red and green cherries! Very festive as well! I’m pretty sure all your guests will love them! So glad to see something that doesn’t involve chocolate today! I’ve been tempted way too many times! 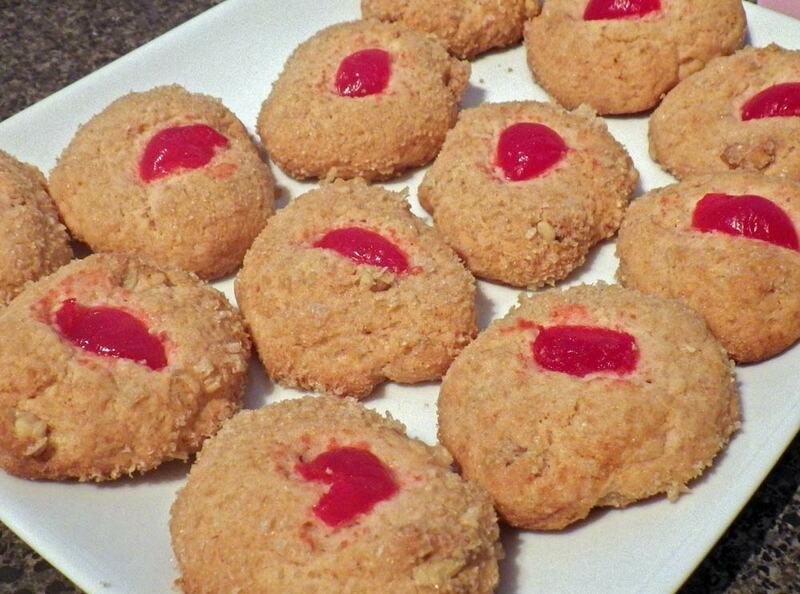 Love the cherries used in your recipe. I like fruit and dessert mixed together!